This Colgate oval bassinet mattress provides a firm, supportive yet extra comfortable two" thick sleeping surface for infants. The 15" by 30" by 2" oval shape mattress will fit many popular styles and brands of bassinets. 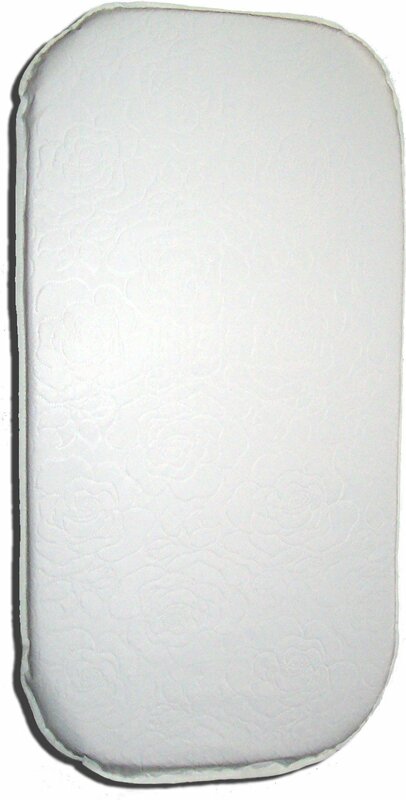 The white quilted vinyl cover is waterproof, tear-resistant and easy to clean with a damp cloth and mild soap. This bassinet mattress can be used on either side unlike some bassinet mattresses. The Colgate bassinet mattress is greenguard certified to their gold standard to pass low emissions standards which tests for over 10,000 volatile organic compounds (VOC's), uses certipur-us certified emissions tested and durability tested and performance tested foam. This product passes all national and state flammability standards without the use of harmful flame retardant chemicals. This product passes the CPSIA standards for safe chemical composition. This bassinet mattress is made by Colgate, the crib mattress specialist since 1955. It is proudly made in the USA. It is recommended that you measure your bassinet to ensure a snug bassinet mattress fit.